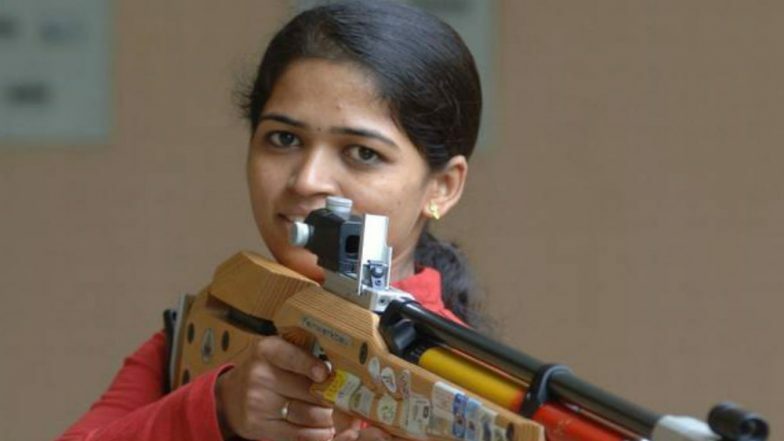 Mumbai, March 18: When a young and little known Tejaswini Sawant was in urgent need of financial help to participate in a shooting world championship in Germany, Goa chief minister Manohar Parrikar came as her ray of hope. The support not only enabled the shooter from Kolhapur in Maharashtra to participate in the competition in 2005, but also became a turning point in her career as she scaled new heights thereafter, Sawant said. Her only regret now is that she could not thank the chief minister enough for his generosity which made a big contribution in her life and shooting career. "It was a brief meeting with Parrikar along with family friend and senior BJP leader Chandrakant Patil. He just listened about my performance and estimated the expenditure. He then signed a cheque for me immediately," the ace shooter recalled while talking to PTI over phone. LIVE Manohar Parrikar Funeral Procession, Last Rites Live News Updates: Cremation of Late Goa CM Shortly. "The amount was around Rs 1 lakh and it was the most needed help for me that changed my entire career," she said. It helped Sawant move ahead as she scored 397 and 396 out of 400 in two rounds of the event, comfortably securing a place among the mainstream shooters to represent India. The boost further helped her in improving her performance game by game, and she subsequently became the first Indian woman shooter to win a gold medal at the World Championships, with a world-record equalling score in the 50m rifle prone event in 2010 in Germany. Manohar Parrikar Death: Goa Board of Secondary and Higher Secondary Education Postpones Monday’s Exam, Reschedules it to March 29. "I could do it only because of two people. First, Manohar Parrikar for his trust and financial support, and then Chandrakant Patil, who took my case to Parrikar," she said. Since 2006, Sawant won several gold and other medals in international championships. She said after the early success in her career, she received offers for a job in the Goa government and financial help for travel and training expenses till she wanted to play. When contacted, Patil, who is currently Maharashtra's revenue minister, said he shared close ties with Parrikar. He said when Sawant approached him, Parrikar's name came to his mind and he called up his number for help. "He was like that (generous). In case of Tejaswini, Parrikar helped her in his own capacity. He didn't use the government money. Though he spent from his pocket, he never brought up the issue in our subsequent conversations," Patil said.